Congratulations to: Vincent Fryer, Jon Brown, Chuck Watson, Marcelo Figuroa, Ryan Su, Anthony Barrett, Beth Ritchie, Bex Pie, Nolan McCobb, Tank, Katie Ritchie, and Skylar Caceres! The Monstore, located in Montclair, California, is holding a Constructed Exodus Tournament and Booster Draft this Saturday, February 28! The Constructed Tournament is free and the Draft entry fee is only the cost of 4 booster packs. Players are already RSVPing and you could win the above prizes! All participants receive an entry promo and there are awesome prizes for Top 3, including that beautiful Champion playmat!! Players are encouraged to just show up and play, but here is the event page for more details. We want to keep you updated on everything we're doing at Existence Games. 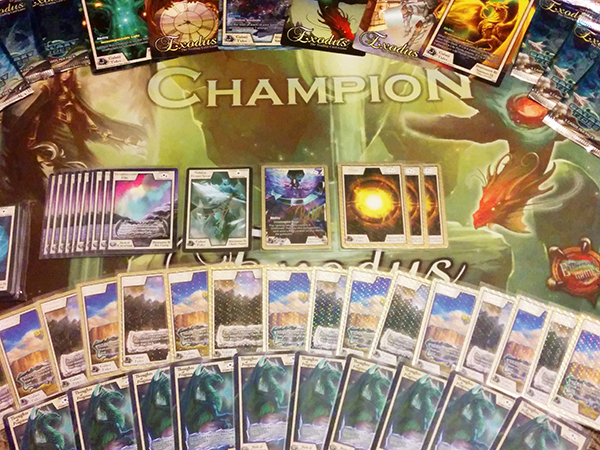 Officially supported Organized Play for the Exodus TCG is nearly ready! We're giving you the first peek at what the OP site is going to look like! Remember, playing in the tournaments at Monstore will count toward your Ranking when the site goes live! Jake and Lexi from Existence Games will be demoing Exodus at the Long Beach Comic Con this weekend on the 28th and 29th! If you're attending or local to the area, come by our booth for a special card! Energy receives this month's spotlight! But this isn't any regular ol' energy card. 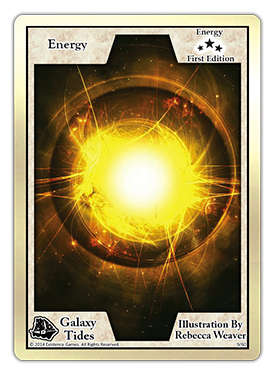 This is the foil, gold energy that can be pulled out of the Galaxy Tides booster pack! These are currently among the most popular cards at every major tournament lately, and pulling these definitely gives you awesome trade-value at the very least! How cool would it be to make a full foil energy deck?! The card art is illustrated by the incredibly talented Rebecca Weaver, and can even be won signed by the artist at tournaments! If you yourself are searching for these, you can pull up to 2 per box! With 25 Rares in the set, you essentially have a 1/25 chance of getting the Rare you're after. Of course, not every box has 1; consider yourself lucky if you open this in a booster pack!